Recently, I spent a few hours in a conference room with 60 young tech entrepreneurs in downtown Kingston. Their excitement was palpable. This was the final day of the Start-Up Jamaica boot camp, led by coaches from Oasis500, a Jordanian company that provides entrepreneurship training, business incubation, mentoring, and seed funding to help turn new tech ideas into startups. Oasis500 is one of the key partners supporting Start-Up Jamaica, the first Jamaican accelerator focusing on technology. This initiative is a unique public-private sector partnership, bringing together the Ministry of Science, Technology, Energy and Mining, the Jamaica National Building Society, LIME Jamaica (formerly Cable and Wireless), Oasis500, the National Commercial Bank of Jamaica, and Caribbean Export Development Agency. Start-Up Jamaica is an important step in providing support to fledgling companies, but it is also viewed by the partners as much more: a key part of positioning the country to be an entrepreneurship and innovation hub in the Caribbean. Start-Up Jamaica was launched on September 8th and is based on the successful model of Start-Up Chile. Its first cohort of participants was selected from over 200 applicants, most from Jamaica and other Caribbean countries, but also including countries as far away as Botswana. After boot camp, participants’ some as individuals and some in teams’ are going through a 3-4 week planning and feedback process, culminating in a pitching event before a jury of local investors. Those who are successful will receive business model training, where they can prepare for a final pitch to receive seed funding from Oasis500 and local investors. Of this group, 10 teams will then be selected to enter a 3-month Mentorship and Acceleration program to effectively launch their businesses. 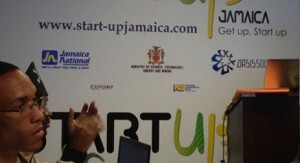 Start-Up Jamaica, with its catchy Marleyesque slogan ‘Get Up, Start Up, builds on several other Jamaican initiatives of the last few years. Examples include the Branson Center for Entrepreneurship in Montego Bay; Startup Weekend, launched last year by the nonprofit ConnectiMass to promote tech entrepreneurship and innovation in the Caribbean through social media and face-to-face community events; and Digital Jam, an app competition supported by a coalition of donors (World Bank, CDB, the Government of Canada and others). 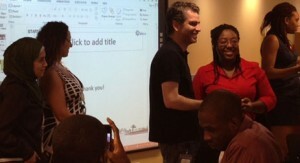 Jamaican youth are being provided with the tools they need to develop their ideas into viable businesses. Pitching your business concept to secure seed funding is now the order of the day. Several young Jamaican teams have excelled in their own right in local and international pitching competitions. Two young MBA students have formed a company, Regal Farms Ltd., planning to export sea-island cotton from Jamaica. Having won a University of the West Indies business plan competition, they went on to win the Opportunity Fund Business Plan Competition in Atlanta this year, and placed 20th in an International VC competition in Texas. Herboo Enterprise, a team of 5 student entrepreneurs, won the national business plan competition sponsored by the 3 universities in Jamaica; and then won the first prize among international entries and eighth place overall at the International Business Model Competition in Utah in May of this year. The challenge is now to leverage and build on these early successes to build momentum and to create a strong entrepreneurial culture so that an important aspect of the ecosystem for angel investing and venture capital in Jamaica can be developed. The MIF, through its current support to the Development Bank of Jamaica, has a key role to play in the process. This post was originally published on Caribbean DevTrends. Great Article. It is interesting what people comment on. We need more programs like this that encourage business.